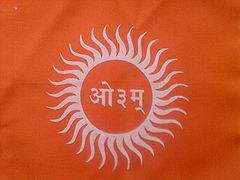 Arya Samaj (Sanskrit ārya samāja "Noble Society") is a Hindu reform movement founded by Swami Dayananda on 10 April 1875. He was a sanyasi who believed in the infallible authority of the Vedas. Dayananda emphasized the ideals of brahmacharya (chastity). There are approximately 3–4 million followers of Arya Samaj worldwide. Between 1869 and 1873, Swami Dayanand, a native of the Princely State of Gujarat, made his first earnest attempt at affecting a substantial and lasting reform in our motherland India. This attempt took the form of the establishment of several "Vedic Schools" which, in contradiction to other public schools at the time, put a marked emphasis on attempting to impart Vedic values, culture and religion to its students. The first was established at Farrukhabad in 1869 and reported 50 students as being enrolled in its first year. This initial success led to the founding of four additional schools in rapid succession at Mirzapur (1870), Kasganj (1870), Chhalesar (1870) and Varanasi (1873). The Vedic Schools represented the first practical application of Swami Dayanand’s vision of religious and social reform. They enjoyed a mixed reception. On the one hand, students were not allowed to perform traditional idol worship (murtipuja in Hindi) at the school, and were instead expected to perform sandhya (a form of meditative prayer using mantras from the Vedas) and participate in agnihotra twice daily. All meals, lodging, clothing and books were given to the students free of charge, and the study of Sanskrit was opened to non-Brahmins. The most noteworthy feature of the Schools was that only those texts which accepted the authority of the Vedas were to be taught. This was critical for the spiritual and social regeneration of Vedic culture in India. Swami Dayanand made several changes in his approach to the work of reforming Hindu society after having visited Calcutta. The most significant of these changes was that he began lecturing in Hindi. Prior to his tour of Bengal, the Swami had always held his discourses and debates in Sanskrit. While this gained him a certain degree of respect among both the learned and the common people alike, it prevented him from spreading his message to the broader masses. The change to Hindi allowed him to attract increasingly larger following, and as a result his ideas of reform began to circulate among the lower classes of society as well. After hearing some of Swami Dayanand's speeches delivered in Hindi at Varanasi, Raj Jaikishen Das, a native government official there, suggested that the Swami publish his ideas in a book so that they might be distributed among the public. From June to September 1874, Swami Dayanand dictated a comprehensive series of lectures to his scribe, Pundit Bhimsen Sharma, which dealt with his views and beliefs regarding a wide range of subjects including God, the Vedas, Dharma, the soul, science, philosophy, childrearing, education, government and the possible future of both India and the world. The resulting manuscript was eventually published under the title Satyarth Prakash or The Light of Meaning of Truth in 1875 at Varanasi. This voluminous work would prove to play a central role in the establishment and later growth of the organization which would come to be known as the Arya Samaj. While the manuscript of the Satyarth Prakash was being edited at Varanasi, Swami Dayanand received an invitation to travel to Bombay in order to conduct a debate with some representatives of the Vallabhacharya sect. The Swami arrived in Bombay on the 20th of October, 1874. The debate, though greatly publicised, never materialized. Despite this, however, two members of the Prarthana Samaj approached Swami Dayanand and invited him to deliver a few lectures at one of their gatherings, which were received with appreciation by all those present. The members of the Prarthana Samaj of Bombay recognized in Swami Dayanand an individual in possession of the knowledge and skills necessary for promoting their aims, the greatest and most comprehensive of which being the general uplift of Hindu society at large and its protection from what they perceived to be the advancing threat of Christian and Muslim efforts to convert Hindus. After his having spent over a month at Bombay, 60 new-found students of Swami Dayanand – among them, prominent members of the Prarthana Samaj – proposed the notion of founding a 'New Samaj' with the Swami’s ideas serving as its spiritual and intellectual basis. After having received a personal invitation from Gopalrao Hari Deshmukh, Swami Dayanand left Bombay and traveled to Ahmedabad, Gujarat, arriving on the 11th of December, 1874. Once there, he conducted a debate with local pundits on the issue of Vedas, and emerged victorious. It is reported that the formation of a Samaj and the founding of a Vedic School at Ahmedabad was proposed following the widely acknowledged and publicized success of the debate, but it was found that not enough support for such a venture could be mustered. On an invitation from Hargovind Das Dvarkadas, the secretary of the local Prarthana Samaj, Swami Dayanand decided to travel to Rajkot, Gujarat and arrived on the 31st of December, 1874. However, instead of delivering his standard program of lectures, he allowed members of the audience to choose the topics they would like to have him discourse upon. A total of eight topics were chosen, and Swami Dayanand delivered impromptu lectures on all of them to the overwhelming satisfaction of all present. Gifts were bestowed upon the Swami as tokens of gratitude for his masterly orations, and it was announced that the Rajkot Prarthana Samaj was henceforth dissolved and was ready to be reorganized as a new Samaj under the auspices of Swami Dayanand. The Swami, after much deliberation, chose the name ‘Arya Samaj’ or ‘Society of Nobles’. Swami Dayanand himself drafted a list of 28 rules and regulations for the Rajkot Arya Samaj, which he later had printed for distribution. On his way back to Bombay, Swami Dayanand stopped off in Ahmedabad and related the news of Rajkot, Gujarat, distributing copies of the rules and regulations to those present. A meeting was held on the 27th of January, 1875 to discuss the proposal of forming an Arya Samaj there, yet no conclusive decision was reached. Unwilling to wait for the deliberations to come to an end, Swami Dayanand continued on his way to Bombay. While traveling, the Swami received word that the still fragile Rajkot Arya Samaj had involved itself in some political dispute and managed to have a government warning issued against it and its members. Thus, the collapse of the just established society was already looming large. Swami Dayanand reached Bombay on 29 January 1875, and immediately the appeal to establish an Arya Samaj there was renewed. However, the Swami did not want a protracted debate to ensue as had occurred at Ahmedabad, bringing with it the possibility of endless deliberations. Thus, a membership drive was initiated which would circumvent the need for discussions. Within a short time, 100 individuals enrolled themselves as prospective members. On the 10th of April, 1875, the Bombay Arya Samaj was officially established. The original membership amounted to exactly 100 persons, including Swami Dayanand. The members appealed to the Swami that he should serve as either the President or the Guru of the Samaj, but he kindly refused, and instead requested that he be listed as a regular member. On the 24th of June, 1877, the second major Arya Samaj was established at Lahore. The 10 Principles of the Arya Samaj as they are known around the world today came into existence. All subsequently established branches of the Arya Samaj have been founded upon the ten principles. However, each new branch of the Society has a degree of freedom in determining the exact bylaws under which it shall operate. Everyone who wishes to become a member of the Society must agree to uphold these principles in their entirety. However, nothing beyond these 10 Principles has any binding force on any member of the Arya Samaj. For this reason, the early Samaj proved to be attractive to individuals belonging to various religious communities, and enjoyed a notable degree of converts from segments of the Hindu, Sikh, Christian and Muslim populations of Indian society. Drawing what are seen to be the logical conclusions from these principles, the Arya Samaj also unequivocally condemns practices such as polytheism, iconolatry, animal sacrifice, ancestor worship, pilgrimage, priestcraft, the belief in avatars or incarnations of God, the hereditary caste system, untouchability and child marriage on the grounds that all these lack Vedic sanction.